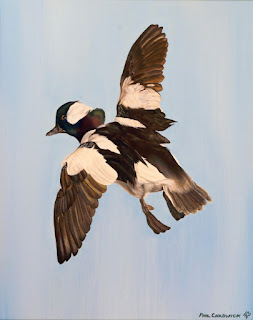 Phil Chadwick's Art: #0015 "Bufflehead"
This was the 15th and next step on my artistic journey after #0014 "Hooded Merganser"... from the fall of 1973. The first year of Physics at Queens and working full time during the summer did not leave much if any time to paint. The Bufflehead actually breeds in the boreal forest North America. This very perky duck is the smallest diving duck. It is so small that it nests in the holes of the Northern Flicker. There are a lot of such holes so finding a nesting site is not too hard. Buffleheads will also nest in boxes. Bufflehead breeding habitat is dominated by ponds and small lakes, where the birds dive for insect larvae and small crustaceans. In winter buffleheads migrate to salt water coasts and feed on crustaceans and molluscs in shallow water bays and inlets. Buffleheads are almost exclusively monogamous and will keep the same mate for several years. Females are also faithful to their natal and breeding areas and will reuse the same nest site year after year. We see them mainly during spring migration when they are one of the first ducks to head north.